Isn’t the Upper West Side — especially the upper reaches of the eighties and into the nineties (and well into the hundreds) — supposed to be for lefty intellectual sorts following familiar routines in their sprawling, rent-controlled prewars? Not anymore, it increasingly seems. 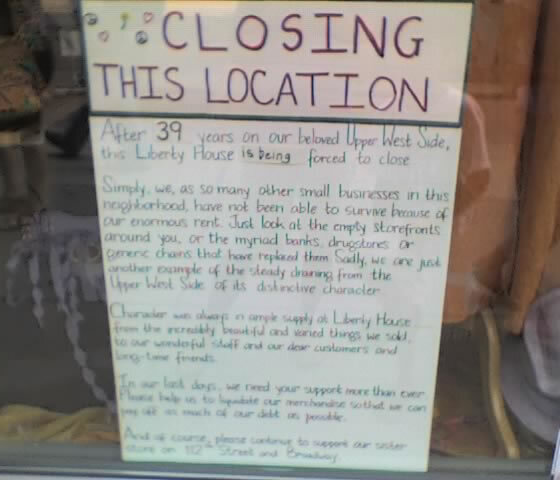 The owners of Liberty House, a neighborhood fixture on Broadway and 92nd, posted a sign two days ago announcing it will close its doors after 39 years in business, leaving area residents wondering where they’ll find antiwar posters, jewelry handmade by local artisans, and Frida Kahlo tchotchkes.